Just over 24 hours ago, as the grand jury in the Tamir Rice shooting was approaching its long-delayed but inevitable non-verdict that removed Officer Timothy Loehmann from the sphere of exaction, the US Marshall's Service was gingerly approaching escaped fugitive Ethan Couch in Mexico. These two stories were perhaps fated by the News Gods to break within 24 hours of each other as they seem to readily offer themselves up for comparison. 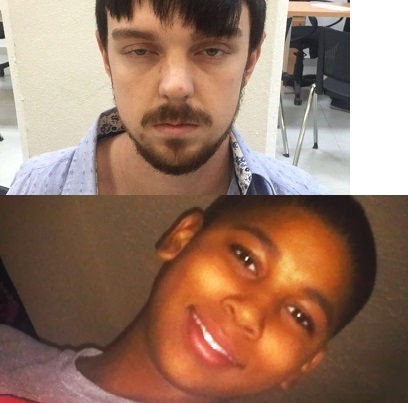 The comparison, of course, is how we treat rich white criminals and innocent African American youth. Couch, I'm sure you remember, was the Texas 16 year-old who'd gotten high and intoxicated, stole his father's car and killed four innocent people on a joyride. The Couch family attorney then infamously called to the stand a psychologist who claimed young Ethan should not be treated too harshly because of "Affluenza". This meant his ability to distinguish right from wrong was impaired because of his parents' coddling and refusal to set boundaries. In Cleveland, Rice, a 12 year-old child, was gunned down last year literally less than two seconds after Loehmann and another officer arrived after a scared old white man called 911. He thought he saw a scary black man with a gun (which he qualified by saying "it's probably fake"). Essentially, it took over a year for the Cuyahoga County prosecutor's office to explain away how and why a black child was gunned down with no chance of preventing his shooting and with impunity. Couch, and his mother, decided two years of probation that had hardly impinged on his life or freedom was more than enough of a price to pay. Just to play Devil's Advocate for a moment, it's a crowning irony that one of the two people harmlessly blamed for impairing young Ethan's ability to tell right from wrong led him on this merry escapade to the Mexican resort town (of course) of Porto Vallarta. Here's the catch: Couch is no longer a wayward, badly-disciplined lad of 16 but a young man of 18. If you don't know right from wrong by that age, then you're officially a sociopath and deserve to have the book thrown at you. Here's the second catch: Despite his age, Couch's original conviction is still technically in the juvenile criminal justice system. Not only does this mean his juvenile records will be sealed should he commit more offenses as a legal adult (And he will. Just think of Couch as George Zimmerman with lots of unearned money), he might very well get off relatively lightly... again. Because, according to Texas state law, "The maximum sentence that a juvenile judge can dish out for a violation of his juvenile probation is imprisonment in a juvenile facility until Couch turns 19, which is April 11, 2016." And if a rich white kid can get four months in jail for skipping not just the state but the country because reporting to a PO for a few minutes a week is too onerous an inconvenience, he could conceivably get out even earlier than that with good behavior (That is, considering this shark-eyed little psycho is even capable of good behavior). Tamir Rice had no high-priced lawyer to blame his parents for raising him so waywardly he was playing with a toy gun at a playground. That is because Tamir Rice was mercilessly gunned down after a stupendously flawed and hasty threat assessment and was killed before he even had the chance to explain why he was holding a toy gun. If he actually reached into his waistband on their arrival as the Cuyahoga County Prosecutor kept insisting, perhaps the boy was merely attempting to show them it was indeed a toy gun. It's unclear whether or not this secretive grand jury even knew that Loehmann was so mentally unbalanced he was pressured out of his last department after having an emotional meltdown on a gun range in the wake of his girlfriend leaving him. Or that the Cleveland Police Department hired this emotionally unstable man without even vetting him. As a nice icing on the cake, it has been reported that Couch had been given a nice little going away party before being rescued by Mommy. I'm pretty sure Tamir Rice never had a going away party before he was viciously gunned down by Timothy Loehmann any more than Couch's four victims had time to assess their lives were in danger.